This is not your average waffle, my friends. 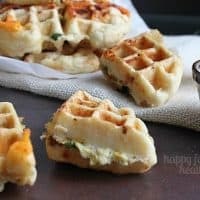 These Savory Egg-Scramble Stuffed Waffles are completely packed to make it a complete breakfast for your next breakfast get together. I’m not sure if I’ve mentioned it, but the majority of the recipes you see here are the product of my wife’s very creative and inventive mind. Or at the very least, the recipes I’ve thought up have been run by her so we can discuss the probability of them working out or how to make them better. 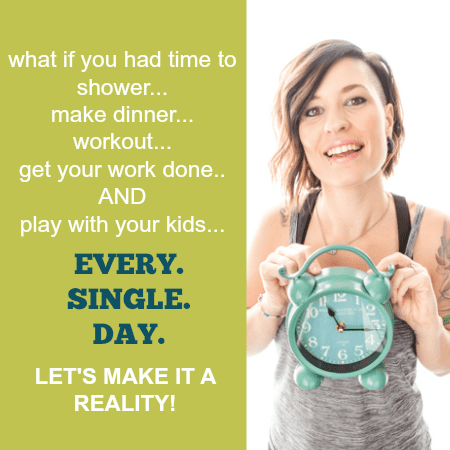 While she’s been away for military the last few months, I have had many dry spells trying to come up with recipes that are creative and that I think will actually work out. A few of my very own creations are the German Chocolate Cake Pockets, or my Healthy Cheesecake Bites in a Quinoa Crust, and then today’s recipe. To be honest, I can’t believe it actually worked out. And not only did it work out, but it’s one of my favorite recipes to date. So waffles. They’re the “it” thing these days, right? Salt Lake City has a dessert waffle truck (Waffle Love), plus I’ve seen lots of waffle sandwiches all over the interwebs, like this one from Haley of The Domestic Rebel. I wanted to take it one step farther. Normally when I eat waffles for breakfast, I feel like I’m missing something. Where’s the protein? I feel like it’s just sweetness and no real health-factor unless I make a side of eggs or veggie-sausage. That’s not usually an issue for me, but for breakfast, I do like to go more the savory route other the sweet. I thought it was time to do something about the issue. So I combined an authentic Belgium waffle where you let the dough rise for about an hour and my favorite breakfast scramble ingredients. Eggs, avocado, Morningstar veggie sausage, spinach, salsa, and cheese. And what was created out of this combination is pure brilliance if I do say so myself! A savory waffle filled with all my favorites, sacrificing nothing in the name of the breakfast extraordinaire. Whisk together the eggs and butter. In a large bowl combine the flour, salt & pepper, chili powder, and basil. Make a well in the center of the flour, and add the liquid ingredients. Divide into 8 individual baseball sized balls and let rest about 15 minutes. 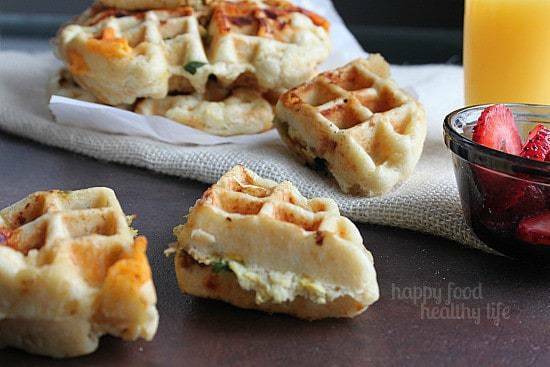 While resting, prepare all your "stuffing" ingredients and have them ready to place on the waffle dough. Heat waffle iron, and brush with oil or melted butter. Stretch the ball of dough out a bit and place it on the waffle iron so it covers the majority of it. 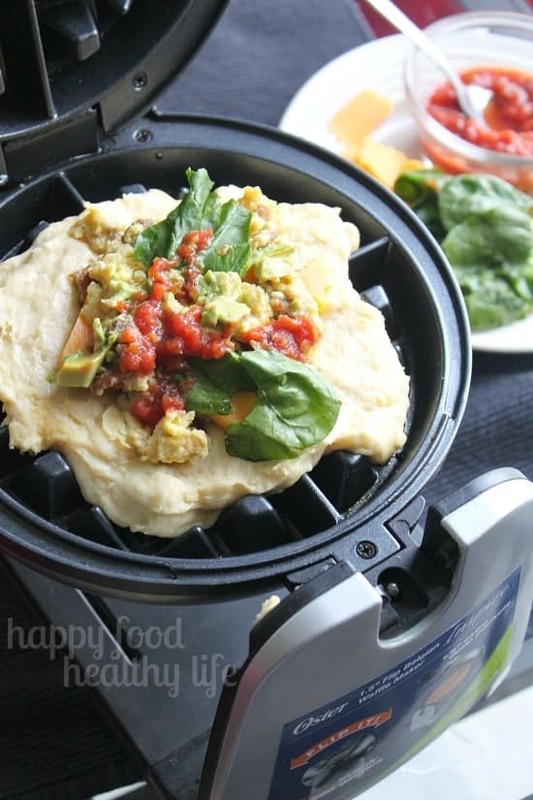 Quickly place about a fourth of your eggs, sausage, cheese, spinach, avocado, and salsa in the middle of the dough. Top with a second ball of stretched out waffle dough. Gently close the waffle iron as best as you can without squishing it all the way at first. Let it cook for about 30-40 seconds before finally closing the lid all the way down. All the toppings will meld into the dough. Cook for about 2-3 minutes, or until your waffle is browned. Very carefully, with a fork or two, remove the waffle from the iron. Continue with the remaining waffles. Serve with ketchup or additional salsa. So what do you think? What would you stuff your waffle with? oh my! This seriously looks delicious! I can’t wait to try it. YUM!!! Kelley you’ve got to! you’ll love it! This is seriously the most amazing thing I have ever seen! I adore waffles and love that you used authentic Belgian waffle batter with all the rest of this goodness. I can only imagine how awesome these taste! Amy, they’re so amazing. Seriously! And now I can’t stop thinking about all the other ways I can stuff my waffles. Stay tuned for lots of other yummy waffle ideas in the future. These sound so wonderful. I’m thinking bacon would go well here too. 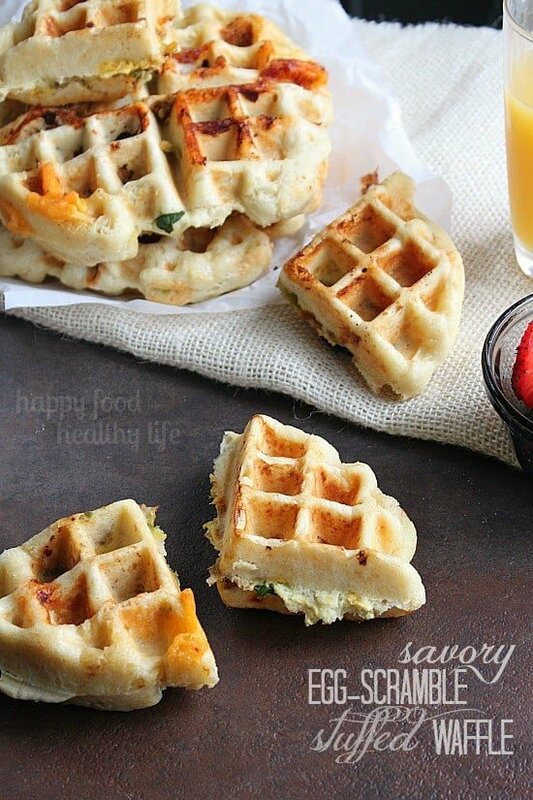 I am eager to try stuffing waffles now! I know what you mean Julia! Ever since this recipe, I’ve had lots of waffle-stuffing ideas swirling around in my head. Oh my oh my! I can’t wait to try and make these! Although, I’m a no bread making kinda girl, so I ‘ll prob have to figure out a substitute. Maybe just make them out with regular ole’ bisquick. What are your thoughts on that? Hey Allie, my honest opinion: I don’t think a traditional waffle mix would work as well. It’s too runny for the eggs+toppings to “set” on. They would just fall the bottom and possibly also get soggy. BUT, let me tell you. I fail at bread-making all the time. Yeast and I have battles. But I’ve never ever failed at this recipe. I’ve made these waffles at least 5-6 times, and it’s a winner. Just follow it to a tee, and you will be good. Trust me! (and then come back and tell me how awesome you did 🙂 ) Thanks for coming by! Do you think making a big batch of these and freezing them would work? Then microwave one or pop it in the toaster to thaw? I’m always looking for recipes I can make in bulk for quick breakfasts. Allison I totally think that would work! Just be sure they are completely cooled before transferring to freezer bags to avoid condensation + sogginess! This looks awesome. Do you think you have to have a belgian waffle maker or do you think a regular waffle maker would work? Yes Kristen, you could use either type of waffle maker for this recipe. I was just doing a little bit of research for you – you really can make Belgian waffles (a yeasted dough) or American waffles (and egg-y batter) in either type of waffle iron. So waffle-on girl! This is an absolutely brilliant idea. We will be making these this weekend. I am having a waffle party, can I make the dough and freeze it before and then make the waffles that day? Excited to make the waffles! !